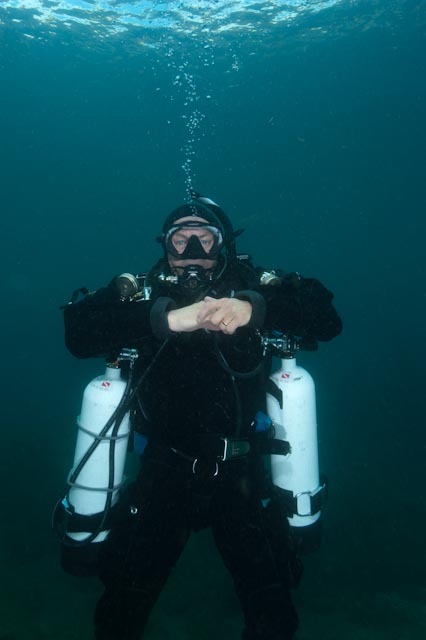 learn to scuba, or learn advanced scuba with sidemount lessons. 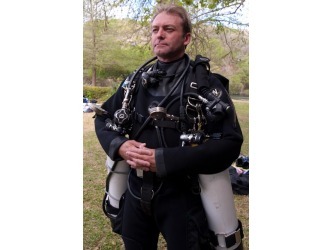 Technical sidemount courses for the adventurous. Deep Down your training matters- Train Right! 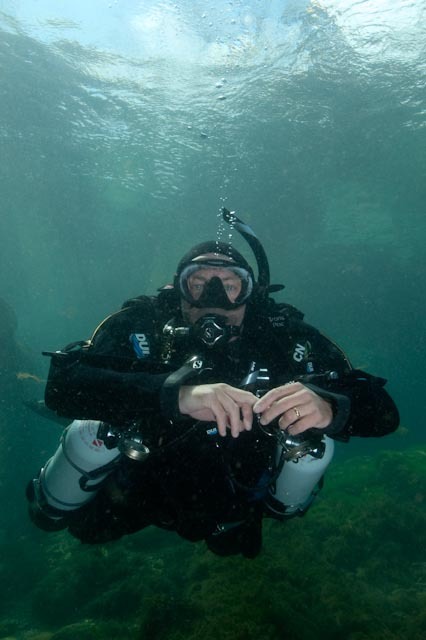 Start your Open Water (beginner) lessons in sidemount- its easy on the body with no heavy equipment to carry around and no previous scuba experience required- start out and learn to dive in sidemount. 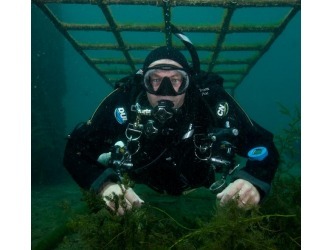 Get your AOW (Advanced Open Water) certification training in sidemount. - NO BACK, KNEE or LEG PROBLEMS - no heavy cylinder on your back! No heavy scuba gear to carry on you, bliss! Sidemount is not for everyone. There are 2 regulators to use, rather than 1 (that's safer of course, but does require an additional regulator- but then an octopus rig is a second regulator, so perhaps it's not so different). Some people, initially, can find managing 2 tanks in the water a bit tricky- so we use smaller tanks! Nice. And a bit of practice sorts that out, riding a bike was tricky the first time too, wasnt it? 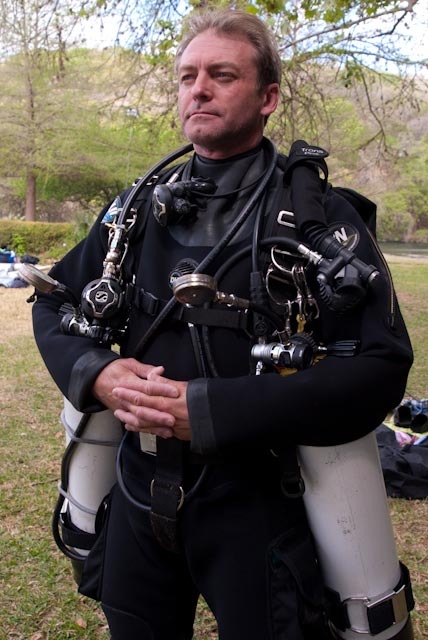 Sidemount Instruction and Side Mount Diving from Austin, TX from the most experienced experienced side mount Instructor. 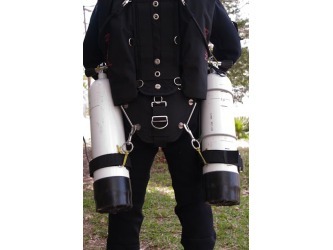 Come and try sidemount- you will enjoy it. 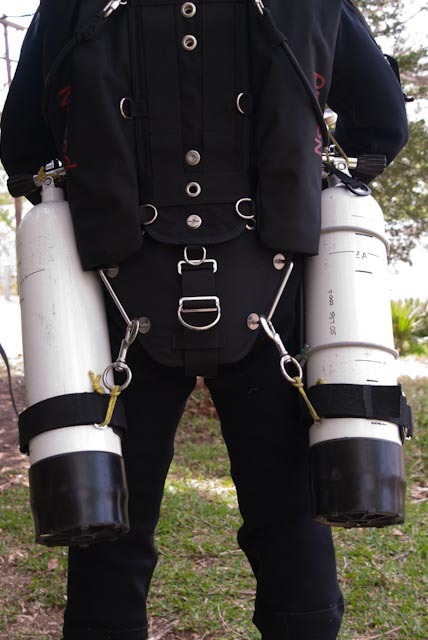 As a diver, have you ever thought to yourself: 'so, I am a diver, what more can I learn now' or, 'what are those guys wearing over there' or 'there has to be a better way than this' or 'this gear is heavy' or 'this is uncomfortable' or worse, 'this diving gear hurts my back/ legs' or even 'I would dive more but it is so uncomfortable/ hurts my legs/ back'? How about 'I like to dive with a pony bottle "for safety"? Oh, my- you are going to like this! Then I invite you to explore Sidemount Diving. As the name suggests, side mount takes a cylinder that would be on your back, and straps it to your side, the immediate advantages? + Your most flexible body part, your back, no longer has rigid metal strapped to it so it can bend again! Making diving very, very, (very) comfortable. + You can put the tank on IN THE WATER so no more walking to the dive site in full, heavy gear under the blazing TX sun! 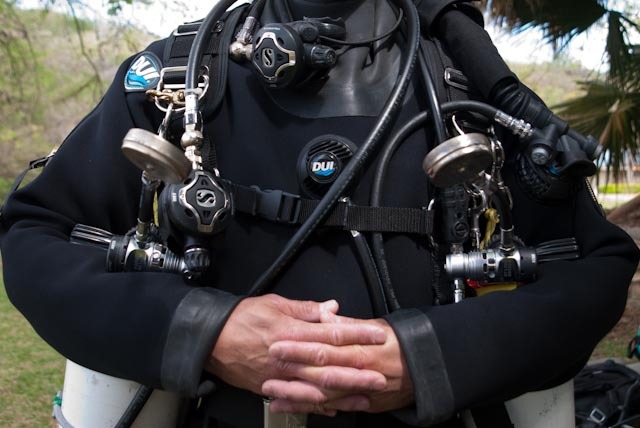 Put the BCD on (without tanks), walk into the water, clip the tanks on- ready to go, comfort, ease and simplicity whether from a boat or the shore. + The added safety factor of a full-sized, second cylinder is enormous, think a pony is the answer? Think again- seriously, think again. +Travel diving is easy. 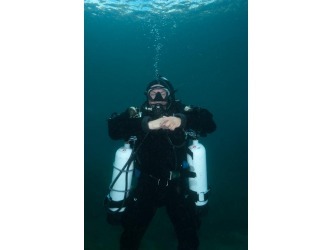 Take a lightweight sidemount BCD and that's it! Resorts all provide rental cylinders so strap those on, use their regulators or take your own and enjoy a comfortable dive with an unsurpassed safety margin and spend much, much more time diving- your dollars spent per minute diving is GREATLY reduced as a result. Check the FAQ for more answers. And of course, this can be technical diving too. Okay, I like the sound of it- how do I train? FULL sidemount GEAR IS PROVIDED for the SIDE MOUNT course including: complete sidemount rigs (Nomads) plus all cam bands and clips etc, cylinders (AL80s, 64s or 50s), 2x sidemount ready regulator sets, and weights, all you need is your regular dive suit, mask, fins etc. Or come with whatever of your own gear you wish to use (eg regulator(s) etc) and we will work that. The course is 4 dives over 2 days and includes: Gear rigging, hoses, trim, buoyancy, gas management, gas shut down, gas sharing, ditch and don of tanks, in-water tank management, boat and shore entry, propulsion techniques including back finning and more! Seriously, explore this. 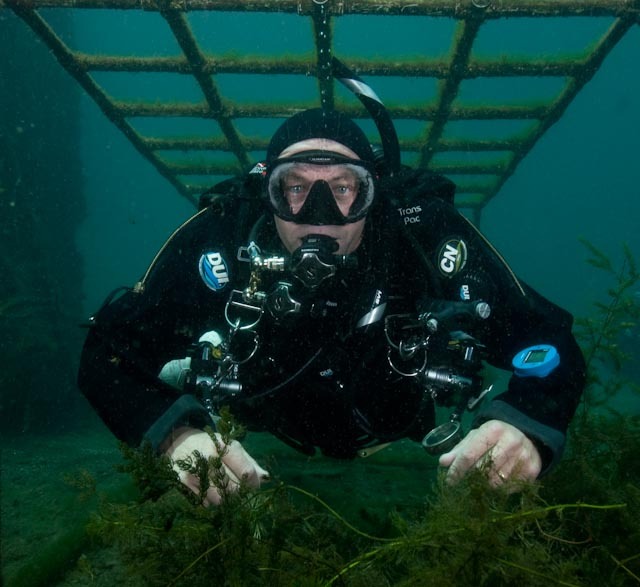 Sidemount is set to take the dive world by storm. 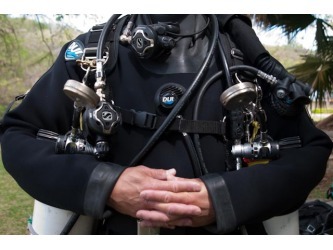 If you are a sidemount instructor- please do not steal my pictures and put them on your website without asking or acknowledging their source- good grief, people, have some creativity of your own, plus some standards of honesty. I am thinking of starting a 'Hall of Shame' given how many sites have stolen pictures of me and used them in their own promotional materials- I am flattered but dont be one of them please.